The Twin Towers of New York City's World Trade Center collapsed after being deliberately struck by two commercial passenger jets during the September 11 attacks. A total of four commercial aircraft were hijacked by al-Qaeda terrorists on 9/11 and two of those were crashed into the Twin Towers. American Airlines Flight 11 was crashed into the north side of the North Tower (One World Trade Center) and United Airlines Flight 175 was crashed into the south side of the South Tower (Two World Trade Center). The collapse of the Twin Towers destroyed the rest of the complex, and debris from the collapsing towers severely damaged or destroyed more than a dozen other adjacent and nearby structures. 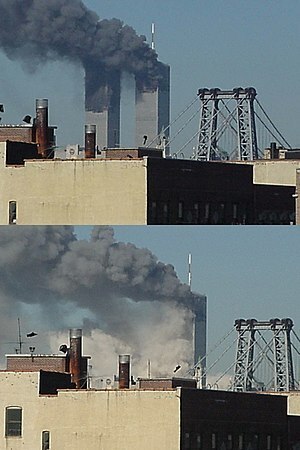 The South Tower collapsed at 9:59 am, less than an hour after being hit, followed by the North Tower at 10:28 am. Later that day, the nearby Seven World Trade Center collapsed at 5:21 pm from fires that had started when the North Tower collapsed. As a result of the attacks to the towers, a total of 2,763 people died including 2,192 civilians, 343 firefighters, and 71 law enforcement officers as well as all the passengers and crew on the airplanes, including 147 civilians and the 10 hijackers. Immediately following the attacks, a building performance study team of engineering specialists was formed by the Structural Engineering Institute of the American Society of Civil Engineers and the Federal Emergency Management Agency. The building performance study team issued its report in May 2002, finding that the aircraft impacts caused, "extensive structural damage, including localized collapse" and that the resulting fires, "further weakened the steel-framed structures, eventually leading to total collapse". In September 2005, the National Institute of Standards and Technology, which also consulted outside engineering entities, produced a more detailed engineering investigation into the collapse. The investigators did not find anything substandard in the design of the twin towers, noting that the severity of the attacks and the magnitude of the destruction was beyond anything experienced in buildings in the past. They also emphasized the role of the fires and found that sagging floors pulled inward on the perimeter columns that "led to the inward bowing of the perimeter columns and failure of the south face of WTC 1 and the east face of WTC 2, initiating the collapse of each of the towers." The cleanup of the World Trade Center site involved round-the-clock operations, many contractors and subcontractors, and cost hundreds of millions of dollars. The demolition of the surrounding damaged buildings continued even as new construction proceeded on the Twin Towers' replacement, One World Trade Center, which was opened in November 2014. As of January 2018[update], five new buildings had been erected on the site; the last one, Two World Trade Center, is scheduled for completion in 2022. During the September 11th attacks, four teams of al-Qaeda terrorists hijacked four different jetliners. Two of these jetliners, both Boeing 767's, were hijacked after takeoff from Boston's Logan International Airport. In its final moments, American Airlines Flight 11 flew south over Manhattan and crashed at roughly 440 miles per hour (710 km/h) into the north facade of the North Tower (WTC 1) at 8:46 am, impacting between the 93rd and 99th floors. Seventeen minutes later, United Airlines Flight 175 approached from the southwest, over New York Harbor, and crashed into the South Tower (WTC 2) south facade at 9:03 am between the 77th and 85th floors at 540 miles per hour (870 km/h). In addition to severing numerous load-bearing columns on the perimeter and inflicting other structural damage, the resulting explosions in each tower ignited 10,000 US gallons (38,000 L) of jet fuel along with office contents. According to NIST estimates, Flight 11 was carrying around 10,000 US gallons (38,000 L) when it hit the North Tower. Up to 1,500 US gallons (5,700 L) was instantly consumed in the initial fireball and a similar amount was consumed in the fireball outside the building. Approximately 7,000 US gallons (26,000 L) burnt inside the office spaces igniting combustibles. Flight 175 was carrying around 9,100 US gallons (34,000 L) when it hit the South Tower. Up to 1,500 US gallons (5,700 L) was instantly consumed in the initial fireball and up to 2,275 US gallons (8,610 L) was consumed in the fireball outside the building. More than 5,325 US gallons (20,160 L) was burnt in the office spaces. NIST estimated that each floor of both buildings contained around four pounds per square foot (60 tons per floor) of combustibles. Jet fuel from the impact traveled down at least one elevator shaft and exploded on the 78th floor of the North Tower, as well as in the main lobby. The light construction and hollow nature of the structures allowed the jet fuel to penetrate far inside the towers, igniting many large fires simultaneously over a wide area of the impacted floors. The fuel from the planes burned at most for a few minutes, but the contents of the buildings burned over the next hour or hour and a half. It has been suggested[by whom?] that the fires might not have been as centrally positioned, nor as intense, had traditionally heavy high-rise construction been standing in the way of the aircraft. 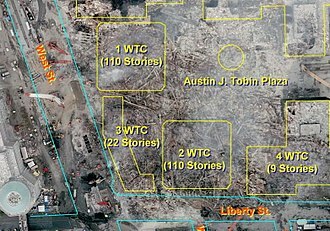 Debris and fuel would likely have remained mostly outside the buildings or concentrated in more peripheral areas away from the building cores, which would then not have become unique failure points. In this scenario, the towers might have stood far longer, perhaps indefinitely. The fires were hot enough to weaken the columns and cause floors to sag, pulling perimeter columns inward and reducing their ability to support the mass of the building above. The final fires at the World Trade Center complex were extinguished on December 20, exactly 100 days after the attacks. Almost all the deaths in the Twin Towers occurred in the zones above the points of aircraft impact. As the North Tower had been struck directly midway into the structure, the three stairways in the tower core were all damaged or blocked by debris preventing escape to lower floors. In the South Tower, the impact was slightly off center to the central section of the tower and stairway A in the northwest portion of the central core was only partially blocked, and 14 to 18 civilians managed to escape from the point of aircraft impact and the floors above that. The exact numbers of who perished and where in some cases is not precisely known, however the National Institute of Standards and Technology report indicated that a total of 1,402 civilians perished at or above the impact point in the North Tower with hundreds estimated to have been killed at the moment of impact. In the South Tower, 614 civilians perished at the impacted floors and the floors above that. Less than 200 of the civilian fatalities occurred in the floors below the impact points but all 147 civilian passengers and crew on the two aircraft as well as all 10 terrorists perished, along with at least 18 people on the ground and in adjacent structures. All told, emergency personnel killed in the collapse included 343 New York City Fire Department (FDNY); and 71 law enforcement officers including 23 members of the New York City Police Department (NYPD), 37 members of the Port Authority Police Department (PAPD), five members of the New York State Office of Tax Enforcement (OTE), three officers of the New York State Office of Court Administration (OCA), one fire marshal of the New York City Fire Department (FDNY) who had sworn law enforcement powers (and was also among the 343 FDNY members killed), one member of the Federal Bureau of Investigation (FBI), and one member of the United States Secret Service (USSS). The total death toll for civilian and non-civilians is estimated to be 2,606 persons. As the fires continued to burn, occupants trapped in the upper floors of the South Tower provided information about conditions to 9-1-1 dispatchers. At 9:37 a.m., an occupant on the 105th floor of the South Tower reported that floors beneath him "in the 90-something floor" had collapsed. The New York City Police Department aviation unit also relayed information about the deteriorating condition of the buildings to police commanders. Only 14 people escaped from above the impact zone of the South Tower after it was hit (including Stanley Praimnath, who saw the plane coming at him), and only four from the floors above it. They escaped via Stairwell A, the only stairwell which had been left intact after the impact. Numerous police hotline operators who received calls from individuals inside the South Tower were not well informed of the situation as it rapidly unfolded. Many operators told callers not to descend the tower on their own, even though it is now believed that Stairwell A was most likely passable at and above the point of impact. At 9:52 a.m., the NYPD aviation unit reported over the radio that "large pieces may be falling from the top of WTC 2. Large pieces are hanging up there". With the warnings, the NYPD issued orders for its officers to evacuate. During the emergency response, there was minimal communication between the NYPD and the New York City Fire Department (FDNY), and overwhelmed 9-1-1 dispatchers did not pass along information to FDNY commanders on-scene. At 9:59 a.m., the South Tower collapsed, 56 minutes after being struck. After the South Tower collapsed, NYPD helicopters relayed information about the deteriorating conditions of the North Tower. At 10:20 a.m., the NYPD aviation unit reported that "the top of the tower might be leaning", and a minute later reported that the North Tower, "is buckling on the southwest corner and leaning to the south". At 10:28 a.m., the aviation unit reported that "the roof is going to come down very shortly" and indeed, the North Tower collapsed immediately thereafter, at 10:28 a.m., after burning for 102 minutes. After the South Tower collapsed, FDNY commanders issued orders for firefighters in the North Tower to evacuate. Due to radio communications problems, firefighters inside the towers did not hear the evacuation order from their supervisors on the scene, and most were unaware that the other tower had collapsed. 343 firefighters died in the Twin Towers, as a result of the collapse of the buildings. No one was able to escape the North Tower from the impact zone or above, as all stairwells and elevator shafts on those floors were destroyed or blocked. After the collapse, light dust reached as far as the Empire State Building, located 2.93 miles (4.72 km) away. As the North Tower collapsed, heavy debris hit 7 World Trade Center, causing damage to the south face of the building and starting fires that continued to burn throughout the afternoon. Structural damage occurred to the southwest corner between Floors 7 and 17 and on the south face between Floor 44 and the roof; other possible structural damage includes a large vertical gash near the center of the south face between Floors 24 and 41. The building was equipped with a sprinkler system, but had many single-point vulnerabilities for failure: the sprinkler system required manual initiation of the electrical fire pumps, rather than being a fully automatic system; the floor-level controls had a single connection to the sprinkler water riser; and the sprinkler system required some power for the fire pump to deliver water. Also, water pressure was low, with little or no water to feed sprinklers. Some firefighters entered 7 World Trade Center to search the building. They attempted to extinguish small pockets of fire, but low water pressure hindered their efforts. Fires burned into the afternoon on the 11th and 12th floors of 7 World Trade Center, the flames visible on the east side of the building. During the afternoon, fire was also seen on floors 6–10, 13–14, 19–22, and 29–30. In particular, the fires on floors 7 through 9 and 11 through 13 continued to burn out of control during the afternoon. At approximately 2:00 pm, firefighters noticed a bulge in the southwest corner of 7 World Trade Center between the 10th and 13th floors, a sign that the building was unstable and might cave to one side or "collapse". During the afternoon, firefighters also heard creaking sounds coming from the building and issued uncertain reports about damage in the basement. Around 3:30 pm FDNY Chief Daniel A. Nigro decided to halt rescue operations, surface removal, and searches along the surface of the debris near 7 World Trade Center and evacuate the area due to concerns for the safety of personnel. At 5:20:33 pm EDT on September 11, 2001, 7 World Trade Center started to collapse, with the crumble of the east mechanical penthouse, while at 5:21:10 pm EDT the entire building collapsed completely. There were no casualties associated with the collapse. When 7 World Trade Center collapsed, debris caused substantial damage and contamination to the Borough of Manhattan Community College's Fiterman Hall building, located adjacent at 30 West Broadway, to the extent that the building was not salvageable. In August 2007, Fiterman Hall was scheduled for dismantling. A revised plan called for demolition in 2009 and completion of the new Fiterman Hall in 2012, at a cost of $325 million. The building was finally demolished in November 2009 and construction of its replacement began on December 1, 2009. The adjacent Verizon Building, an Art Deco building constructed in 1926, had extensive damage to its east facade from the collapse of 7 World Trade Center, though it was successfully restored at a cost of US$1.4 billion. Many of the surrounding buildings were also either damaged or destroyed as the towers fell. 5 WTC endured a large fire and a partial collapse of its steel structure and was torn down. Other buildings destroyed include St. Nicholas Greek Orthodox Church, Marriott World Trade Center (Marriott Hotel 3 WTC), South Plaza (4 WTC), and U.S. Customs (6 WTC). The World Financial Center buildings, 90 West Street, and 130 Cedar Street suffered fires. The Deutsche Bank Building, the Verizon Building, and World Financial Center 3 had impact damage from the towers' collapse, as did 90 West Street. One Liberty Plaza survived structurally intact but sustained surface damage including shattered windows. 30 West Broadway was damaged by the collapse of 7 WTC. The Deutsche Bank Building, which was covered in a large black "shroud" after September 11 to cover the building's damage, was deconstructed because of water, mold, and other severe damage caused by the neighboring towers' collapse. Many works of art were destroyed in the collapse. Both buildings collapsed symmetrically and more or less straight down, though there was some tilting of the tops of the towers and a significant amount of fallout to the sides. In both cases, the section of the building that had been damaged by the airplanes failed, which allowed the floors above the impact zone to fall onto the undamaged structure below. 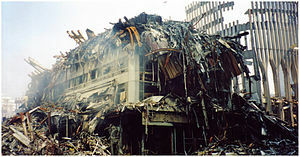 As the collapse progressed, dust and debris could be seen shooting out of the windows several floors below the advancing destruction, caused by the sudden rush of air from the upper levels. The first fragments of the outer walls of the collapsed North Tower struck the ground 11 seconds after the collapse started, and parts of the South Tower after 9 seconds. The lower portions of both buildings' cores (60 stories of WTC 1 and 40 stories of WTC 2) remained standing for up to 25 seconds after the start of the initial collapse before they too collapsed. While the buildings were designed to support enormous static loads, they provided little resistance to the moving mass of the sections above the floors where the collapses initiated. Structural systems respond very differently to static and dynamic loads, and since the motion of the falling portion began as a free fall through the height of at least one story (roughly three meters or 10 feet), the structure beneath them was unable to stop the collapses once they began. Indeed, a fall of only half a meter (about 20 inches) would have been enough to release the necessary energy to begin an unstoppable collapse. After the planes struck the buildings, but before the buildings collapsed, the cores of both towers consisted of three distinct sections. Above and below the impact floors, the cores consisted of what were essentially two rigid boxes; the steel in these sections was undamaged and had undergone no significant heating. The section between them, however, had sustained significant damage and, though they were not hot enough to melt it, the fires were weakening the structural steel. As a result, the core columns were slowly being crushed, sustaining plastic and creep deformation from the weight of floors above. As the top section tried to move downward, however, the hat truss redistributed the load to the perimeter columns. Meanwhile, the perimeter columns and floors were also being weakened by the heat of the fires, and as the floors began to sag they pulled the exterior walls inwards. In the case of 2 WTC, this caused the eastern face to buckle, transferring its loads back to the failing core through the hat truss and initiating the collapse. 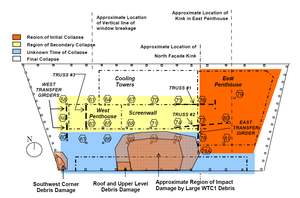 In the case of 1 WTC, the south wall later buckled in the same way, and with similar consequences. The collapse of the World Trade Center has been called "the most infamous paradigm" of progressive collapse. Once the collapse initiated, the mass of failing floors overwhelmed the floors below, causing a progressive series of floor failures which accelerated as the sequence progressed. Soon, large portions of the perimeter columns and possibly the cores were left without any lateral support, causing them to fall laterally towards the outside, pushed by the increasing pile of rubble. The result was that the walls peeled off and separated away from the buildings by a large distance (about 500 feet in some cases), hitting other neighboring buildings. Some connections broke as the bolts snapped, leaving many panels randomly scattered. Significant parts of the naked cores (about 60 stories for the North Tower and 40 for the South Tower) remained standing for a few seconds before they also collapsed. The towers were designed as "framed tube" structures, which provided tenants with open floor plans uninterrupted by columns or walls. Numerous, closely spaced perimeter columns provided much of the strength to the structure, along with gravity load shared with the steel box columns of the core. Above the tenth floor, there were 59 perimeter columns along each face of the building, and there were 47 heavier columns in the core. All of the elevators and stairwells were located in the core, leaving a large column-free space between it and the perimeter that was bridged by prefabricated floor trusses. The floors consisted of 4-inch-thick (10 cm) lightweight concrete slabs laid on a fluted steel deck. A grid of lightweight bridging trusses and main trusses supported the floors with shear connections to the concrete slab for composite action. The trusses had a span of 60 feet (18 m) in the long-span areas and 35 feet (11 m) in the short-span area. The trusses connected to the perimeter at alternate columns, and were therefore on 6.8-foot (2.1 m) centers. The top chords of the trusses were bolted to seats welded to the spandrels on the exterior side and a channel welded to interior box columns on the interior side. The floors were connected to the perimeter spandrel plates with viscoelastic dampers, which helped reduce the amount of sway felt by building occupants. The towers also incorporated a "hat truss" or "outrigger truss" located between the 107th and 110th floors, which consisted of six trusses along the long axis of core and four along the short axis. This truss system allowed optimized load redistribution of floor diaphragms between the perimeter and core, with improved performance between the different materials of flexible steel and rigid concrete allowing the moment frames to transfer sway into compression on the core, which also mostly supported the transmission tower. The structural engineers working on the World Trade Center considered the possibility that an aircraft could crash into the building. In July 1945, a B-25 bomber that was lost in the fog had crashed into the 79th floor of the Empire State Building. A year later, a C-45F Expeditor crashed into the 40 Wall Street building, and there was a near-hit at the Empire State Building. Leslie Robertson, one of the chief engineers working on the design of the World Trade Center, has since said he personally considered the scenario of the impact of a Boeing 707 or another jet airliner, which might be lost in the fog and flying at relatively low speeds while seeking to land at either JFK Airport or Newark Airport. However, in an interview with the BBC, Robertson claimed that, "with the 707, the fuel load was not considered in the design, I don't know how it could have been considered." In the immediate aftermath of the attacks, numerous structural engineers and experts spoke to the media, describing what they thought caused the towers to collapse. Abdolhassan Astaneh-Asl, a structural engineering professor at the University of California at Berkeley, explained that the high temperatures in the fires weakened the steel beams and columns, causing them to become "soft and mushy", and eventually they were unable to support the structure above. Astaneh-Asl also suggested that the fireproofing became dislodged during the initial aircraft impacts. He also explained that, once the initial structural failure occurred, progressive collapse of the entire structure was inevitable. Cesar Pelli, who designed the Petronas Towers in Malaysia and the World Financial Center in New York, remarked, "no building is prepared for this kind of stress." On September 13, 2001, Zdeněk Bažant, professor of civil engineering and materials science at Northwestern University, circulated a draft paper with results of a simple analysis of the World Trade Center collapse. Bažant suggested that heat from the fires was a key factor, causing steel columns in both the core and the perimeter to weaken and experience deformation before losing their carrying capacity and buckling. Once more than half of the columns on a particular floor buckled, the overhead structure could no longer be supported and complete collapse of the structures occurred. Bažant later published an expanded version of this analysis. Other analyses were conducted by MIT civil engineers Oral Buyukozturk and Franz-Josef Ulm, who also described a collapse mechanism on September 21, 2001. They later contributed to an MIT collection of papers on the WTC collapses edited by Eduardo Kausel called The Towers Lost and Beyond. Immediately following the collapses, there was some confusion about who had the authority to carry out an official investigation. While there are clear procedures for the investigation of aircraft accidents, no agency had been appointed in advance to investigate building collapses. A team was quickly assembled by the Structural Engineers Institute of the American Society of Civil Engineers, led by W. Gene Corley, Senior Vice President of CTLGroup. It also involved the American Institute of Steel Construction, the American Concrete Institute, the National Fire Protection Association, and the Society of Fire Protection Engineers. ASCE ultimately invited FEMA to join the investigation, which was completed under the auspices of the latter. The investigation was criticized by some engineers and lawmakers in the U.S. It had little funding, no authority to demand evidence, and limited access to the WTC site. One major point of contention at the time was that the cleanup of the WTC site was resulting in the destruction of the majority of the buildings' steel components. Indeed, when NIST published its final report, it noted "the scarcity of physical evidence" that it had had at its disposal to investigate the collapses. Only a fraction of a percent of the buildings remained for analysis after the cleanup was completed: some 236 individual pieces of steel, although 95% of structural beams and plates and 50% of the reinforcement bars were recovered. FEMA published its report in May 2002. While NIST had already announced its intention to investigate the collapses in August of the same year, by September 11, 2002 (a year after the disaster), there was growing public pressure for a more thorough investigation. Congress passed the National Construction Safety Team bill in October 2002, giving NIST the authority to conduct an investigation of the World Trade Center collapses. FEMA suggested that fires in conjunction with damage resulting from the aircraft impacts were the key to the collapse of the towers. Thomas Eagar, Professor of Materials Engineering and Engineering Systems at MIT, described the fires as "the most misunderstood part of the WTC collapse". This is because the fires were originally said to have "melted" the floors and columns. Jet fuel is essentially kerosene and would have served mainly to ignite very large, but not unusually hot, hydrocarbon fires. As Eagar said, "The temperature of the fire at the WTC was not unusual, and it was most definitely not capable of melting steel." This led Eagar, FEMA and others to focus on what appeared to be the weakest point of the structures, namely, the points at which the floors were attached to the building frame. The large quantity of jet fuel carried by each aircraft ignited upon impact into each building. A significant portion of this fuel was consumed immediately in the ensuing fireballs. The remaining fuel is believed either to have flowed down through the buildings or to have burned off within a few minutes of the aircraft impact. The heat produced by this burning jet fuel does not by itself appear to have been sufficient to initiate the structural collapses. However, as the burning jet fuel spread across several floors of the buildings, it ignited much of the buildings’ contents, causing simultaneous fires across several floors of both buildings. The heat output from these fires is estimated to have been comparable to the power produced by a large commercial power generating station. Over a period of many minutes, this heat induced additional stresses into the damaged structural frames while simultaneously softening and weakening these frames. This additional loading and the resulting damage were sufficient to induce the collapse of both structures. The outer shell of the South Tower (tower 2) of the WTC is still standing at right. The 22-story Marriott Hotel in the foreground was crushed when the south tower collapsed. After the FEMA report had been published, and following pressure from technical experts, industry leaders and families of victims, the Commerce Department's National Institute of Standards and Technology conducted a three-year, $16 million investigation into the structural failure and progressive collapse of several WTC complex structures. The study included in-house technical expertise, along with assistance from several outside private institutions, including the Structural Engineering Institute of the American Society of Civil Engineers, Society of Fire Protection Engineers, National Fire Protection Association, American Institute of Steel Construction, Simpson Gumpertz & Heger Inc., Council on Tall Buildings and Urban Habitat, and the Structural Engineers Association of New York. The scope of the NIST investigation was focused on identifying "the sequence of events" that triggered the collapse, and did not include detailed analysis of the collapse mechanism itself (after the point at which events made the collapse inevitable). In line with the concerns of most engineers, NIST focused on the airplane impacts and the spread and effects of the fires, modeling these using the software program Fire Dynamics Simulator. NIST developed several highly detailed structural models for specific sub-systems such as the floor trusses as well as a global model of the towers as a whole which is less detailed. These models are static or quasi-static, including deformation but not the motion of structural elements after rupture as would dynamic models. So, the NIST models are useful for determining how the collapse was triggered, but do not shed light on events after that point. James Quintiere, professor of fire protection engineering at the University of Maryland, called the spoliation of the steel "a gross error" that NIST should have openly criticized. He also noted that the report lacked a timeline and physical evidence to support its conclusions. Some engineers have suggested that understanding of the collapse mechanism could be improved by developing an animated sequence of the collapses based on a global dynamic model, and comparing it with the video evidence of the actual collapses. The NIST report for WTC 7 concluded that no blast sounds were heard on audio and video footage, or were reported by witnesses. In May 2002, FEMA issued a report on the collapse based on a preliminary investigation conducted jointly with the Structural Engineering Institute of the American Society of Civil Engineers under leadership of Dr. W. Gene Corley, P.E. FEMA made preliminary findings that the collapse was not primarily caused by actual impact damage from the collapse of 1 WTC and 2 WTC but by fires on multiple stories ignited by debris from the other two towers that continued unabated due to lack of water for sprinklers or manual firefighting. The report did not reach conclusions about the cause of the collapse and called for further investigation. In response to FEMA's concerns, the National Institute of Standards and Technology (NIST) was authorized to lead an investigation into the structural failure and collapse of the World Trade Center twin towers and 7 World Trade Center. The investigation, led by Dr S. Shyam Sunder, drew not only upon in-house technical expertise, but also upon the knowledge of several outside private institutions, including the Structural Engineering Institute of the American Society of Civil Engineers (SEI/ASCE), the Society of Fire Protection Engineers (SFPE), the National Fire Protection Association (NFPA), the American Institute of Steel Construction (AISC), the Council on Tall Buildings and Urban Habitat (CTBUH), and the Structural Engineers Association of New York (SEAoNY). The bulk of the investigation of 7 World Trade Center was delayed until after reports were completed on the collapse of the World Trade Center twin towers. In the meantime, NIST provided a preliminary report about 7 World Trade Center in June 2004, and thereafter released occasional updates on the investigation. According to NIST, the investigation of 7 World Trade Center was delayed for a number of reasons, including that NIST staff who had been working on 7 World Trade Center were assigned full-time from June 2004 to September 2005 to work on the investigation of the collapse of the twin towers. In June 2007, Shyam Sunder explained, "We are proceeding as quickly as possible while rigorously testing and evaluating a wide range of scenarios to reach the most definitive conclusion possible. The 7 WTC investigation is in some respects just as challenging, if not more so, than the study of the towers. However, the current study does benefit greatly from the significant technological advances achieved and lessons learned from our work on the towers." In November 2008, NIST released its final report on the causes of the collapse of 7 World Trade Center. This followed their August 21, 2008 draft report which included a period for public comments. In its investigation, NIST utilized ANSYS to model events leading up to collapse initiation and LS-DYNA models to simulate the global response to the initiating events. NIST determined that diesel fuel did not play an important role, nor did the structural damage from the collapse of the twin towers, nor did the transfer elements (trusses, girders, and cantilever overhangs). But the lack of water to fight the fire was an important factor. The fires burned out of control during the afternoon, causing floor beams near Column 79 to expand and push a key girder off its seat, triggering the floors to fail around column 79 on Floors 8 to 14. With a loss of lateral support across nine floors, Column 79 soon buckled – pulling the East penthouse and nearby columns down with it. With the buckling of these critical columns, the collapse then progressed east-to-west across the core, ultimately overloading the perimeter support, which buckled between Floors 7 and 17, causing the entire building above to fall downward as a single unit. From collapse timing measurements taken from a video of the north face of the building, NIST observed that the building's exterior facade fell at free fall acceleration through a distance of approximately 8 stories (32 meters, or 105 feet), noting "the collapse time was approximately 40 percent longer than that of free fall for the first 18 stories of descent." The fires, fueled by office contents, along with the lack of water, were the key reasons for the collapse. The collapse of the old 7 World Trade Center is remarkable because it was the first known instance of a tall building collapsing primarily as a result of uncontrolled fires. 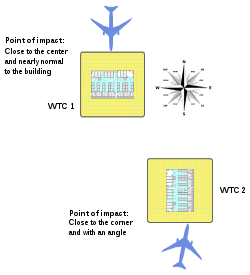 Based on its investigation, NIST reiterated several recommendations it had made in its earlier report on the collapse of the twin towers, and urged immediate action on a further recommendation: that fire resistance should be evaluated under the assumption that sprinklers are unavailable; and that the effects of thermal expansion on floor support systems be considered. Recognizing that current building codes are drawn to prevent loss of life rather than building collapse, the main point of NIST's recommendations is that buildings should not collapse from fire even if sprinklers are unavailable. In 2003, Asif Usmani, Professor of Structural Engineering at University of Edinburgh, published a paper with two colleagues. They provisionally concluded the fires alone, without any damage from the airplanes, could have been enough to bring down the buildings. In their view, the towers were uniquely vulnerable to the effects of large fires on several floors at the same time. When the NIST report was published, Barbara Lane, with the UK engineering firm Arup, criticized its conclusion that the loss of fire proofing was a necessary factor in causing the collapses; "We have carried out computer simulations which show that the towers would have collapsed after a major fire on three floors at once, even with fireproofing in place and without any damage from plane impact." Jose L Torero, formerly of the BRE Centre for Fire Safety Engineering at the University of Edinburgh, pursued further research into the potentially catastrophic effects of fire on real-scale buildings. The cleanup was a massive operation coordinated by the City of New York Department of Design and Construction. On September 22, a preliminary cleanup plan was delivered by Controlled Demolition, Inc. (CDI) of Phoenix, Maryland. Costing hundreds of millions of dollars, it involved round-the-clock operations with many contractors and subcontractors. By early November, with a third of the debris removed, officials began to reduce the number of firefighters and police officers assigned to recovering the remains of victims, in order to prioritize the removal of debris. This caused confrontations with firefighters. Despite efforts to extinguish the blaze, the large pile of debris burned for three months, until the majority of the rubble was finally removed from the site. In 2007, the demolition of the surrounding damaged buildings was still ongoing as new construction proceeded on the World Trade Center's replacement, 1 World Trade Center. The collapse of the World Trade Center produced enormous clouds of dust that covered Manhattan for days. On September 18, 2001, the United States Environmental Protection Agency (EPA) assured the public that the air in Manhattan was "safe to breathe". In 2003 the EPA's inspector general found that the agency did not at that time have sufficient data to make such a statement. Dust from the collapse seriously reduced air quality and is likely the cause of many respiratory illnesses in lower Manhattan. Asbestosis is such an illness, and asbestos would have been present in the dust. Significant long term medical and psychological effects have been found among first responders including elevated levels of asthma, sinusitis, gastroesophageal reflux disease and posttraumatic stress disorder. Health effects also extended to residents, students, and office workers of Lower Manhattan and nearby Chinatown. Several deaths have been linked to the toxic dust, and the victims' names will be included in the World Trade Center memorial. More than 18,000 people have suffered from illnesses from the dust. ^ Despite reports that both towers had asbestos fireproofing to their 64th floors and that the fireproofing was being replaced due to its asbestos content, in fact the builders had been informed of a proposed ban on using asbestos/vermiculite fireproofing during construction and had ceased using it. By this time, only the fireproofing of the lower 40 floors of the north tower had been completed, and more than half of this was later replaced before the building was completed. NIST concluded that the thickness of the fireproofing was 0.75 inches (1.9 cm) in the North Tower and 1.5 inches (3.8 cm) in the South Tower. NIST noted that upon reviewing the building records, it could not determine how this thickness was arrived at. NIST further concluded that the aircraft impact removed a significant portion of the fireproofing, contributing to the buildings' collapse, though many engineers, including one of NIST's top advisers, strongly disputed that claim, instead saying the fireproofing was simply not thick enough. ^ "Bin Laden claims responsibility for 9/11". CBC News. October 29, 2004. Retrieved July 18, 2018. al-Qaeda leader Osama bin Laden appeared in a new message aired on an Arabic TV station Friday night, for the first time claiming direct responsibility for the 2001 attacks against the United States. ^ "Security Council Condemns, 'In Strongest Terms', Terrorist Attacks on the United States". United Nations. September 12, 2001. Retrieved September 11, 2006. The Security Council today, following what it called yesterday’s "horrifying terrorist attacks" in New York, Washington, D.C., and Pennsylvania, unequivocally condemned those acts, and expressed its deepest sympathy and condolences to the victims and their families and to the people and Government of the United States. ^ "PartIIC – WTC 7 Collapse" (PDF). NIST Response to the World Trade Center Disaster. National Institute of Standards and Technology. April 5, 2005. Retrieved November 1, 2006. ^ "NIST Response to the World Trade Center Disaster" (PDF). Retrieved April 23, 2008. ^ a b c d "Final Report on the Collapse of the World Trade Center (chapter 1)" (PDF). National Institute of Standards and Technology (NIST). September 2005. ^ National Construction Safety Team (September 2005). "Executive Summary" (PDF). Final Report on the Collapse of the World Trade Center Towers. NIST. ^ "Accused 9/11 plotter Khalid Sheikh Mohammed faces New York trial". Cabne News Network. November 13, 2009. Retrieved August 29, 2010. ^ "McKinsey Report – Increasing FDNY's Preparedness". August 19, 2002. Archived from the original on June 8, 2014. Retrieved January 16, 2016. ^ National Commission on Terrorist Attacks (July 22, 2004). The 9/11 Commission Report (PDF) (first ed.). W. W. Norton & Company. p. 294. ISBN 978-0-393-32671-0. ^ "McKinsey Report – Improving NYPD Emergency Preparedness and Response" (PDF). August 19, 2002. Archived from the original (PDF) on June 15, 2007. Retrieved July 10, 2007. ^ "McKinsey Report – Emergency Medical Service response" (PDF). FDNY / McKinsey & Company. August 9, 2002. Retrieved July 12, 2007. ^ a b c "Interim Report on WTC 7" (PDF). Appendix L. National Institute of Standards and Technology. 2004. Archived from the original (PDF) on August 9, 2007. Retrieved August 20, 2007. ^ a b c d e NIST NCSTAR1-A: Final Report on the Collapse of World Trade Center Building 7 (PDF). NIST. November 2008. Retrieved July 11, 2011. ^ Grosshandler, William. "Active Fire Protection Systems Issues" (PDF). NIST. Retrieved September 11, 2007. ^ Evans, David D (September 2005). "Active Fire Protection Systems" (PDF). NIST. Retrieved August 26, 2010. ^ "Oral Histories From Sept. 11 – Interview with Captain Anthony Varriale" (PDF). The New York Times. December 12, 2001. Retrieved August 22, 2007. ^ Spak, Steve (September 11, 2001). WTC 9-11-01 Day of Disaster (Video). New York City: Spak, Steve. ^ Scheuerman, Arthur (December 8, 2006). "The Collapse of Building 7" (PDF). NIST. Retrieved June 29, 2007. ^ a b c d "Questions and Answers about the NIST WTC 7 Investigation". NIST. May 24, 2010. Retrieved August 26, 2010. ^ "WTC: This Is Their Story, Interview with Chief Peter Hayden". Firehouse.com. September 9, 2002. Retrieved March 3, 2011. ^ "WTC: This Is Their Story, Interview with Captain Chris Boyle". Firehouse.com. August 2002. Retrieved March 3, 2011. ^ "Oral Histories From Sept. 11 – Interview with Chief Daniel Nigro". The New York Times. October 24, 2001. Retrieved June 28, 2007. ^ "Fiterman Hall — Project Updates". Lower Manhattan Construction Command Center/LMDC. Archived from the original on September 12, 2007. Retrieved August 23, 2007. ^ "Lower Manhattan: Fiterman Hall". LowerManhattan.info. Lower Manhattan Construction Command Center. Archived from the original on September 12, 2007. Retrieved January 18, 2010. ^ "Verizon Building Restoration". New York Construction (McGraw Hill). Retrieved June 28, 2007. ^ Varchaver, Nicholas (March 20, 2008). "The tombstone at Ground Zero". CNN. Archived from the original on May 3, 2011. Retrieved April 11, 2011. ^ "130 Liberty Street: Project Updates". Lower Manhattan Construction Command Center. March 25, 2011. Archived from the original on March 28, 2011. Retrieved April 11, 2011. ^ a b c d "Answers to Frequently Asked Questions". National Institute of Standards and Technology. August 2006. Retrieved May 25, 2012. ^ Bažant, Z. K. P.; Le, J. L.; Greening, F. R.; Benson, D. B. (2008). "What Did and Did Not Cause Collapse of World Trade Center Twin Towers in New York?" (PDF). Journal of Engineering Mechanics. 134 (10): 892. doi:10.1061/(ASCE)0733-9399(2008)134:10(892). ^ Bažant, Zdeněk P.; Mathieu Verdure (March 2007). "Mechanics of Progressive Collapse: Learning from World Trade Center and Building Demolitions" (PDF). J. Engrg. Mech. 133 (3): 308–319. CiteSeerX 10.1.1.121.4166. doi:10.1061/(ASCE)0733-9399(2007)133:3(308). Retrieved August 22, 2007. ^ Hamburger, Ronald; et al. "World Trade Center Building Performance Study" (PDF). Federal Emergency Management Agency. pp. 2–27 & 2–35. Retrieved July 27, 2006. ^ "Aerospaceweb.org – Ask Us – B-25 Empire State Building Collision". aerospaceweb.org. Retrieved July 9, 2015. ^ a b Glanz, James; Eric Lipton (September 8, 2002). "The Height of Ambition". The New York Times. ^ Nalder, Eric (February 27, 1993). "Twin Towers Engineered to Withstand Jet Collision". The Seattle Times. ^ "9/11 World Trade Center: Asbestos Exposure Health Concerns". ^ Perlman, David (September 12, 2001). "Jets hit towers in most vulnerable spots". San Francisco Chronicle. ^ Gugliotta, Guy (September 12, 2001). "'Magnitude Beyond Anything We'd Seen Before'; Towers Built to Last But Unprepared For Such an Attack". The Washington Post. ^ Bažant, Zdeněk P.; Yong Zhou (January 2002). "Why Did the World Trade Center Collapse?—Simple Analysis" (PDF). Journal of Engineering Mechanics. 128 (1): 2–6. doi:10.1061/(ASCE)0733-9399(2002)128:1(2). Retrieved June 18, 2009. ^ Buyukozturk, Oral, Franz-Josef Ulm (2001). "How safe are our skyscrapers? : The World Trade Center collapse". Massachusetts Institute of Technology. Retrieved June 26, 2006. ^ Kausel, Eduardo (2002). "The Towers Lost and Beyond". Massachusetts Institute of Technology. Retrieved June 26, 2006. ^ a b "Experts Debate Future of the Skyscraper in Wake of Disaster". Engineering News-Record. September 24, 2001. ^ "NIST's Responsibilities Under the National Construction Safety Team Act". Archived from the original on April 19, 2010. Retrieved April 23, 2008. ^ Eagar & Musso 2001, p. 8: "The fire is the most misunderstood part of the WTC collapse. Even today, the media report (and many scientists believe) that the steel melted." ^ Eagar & Musso 2001, p. 10: "The maximum flame temperature increase for burning hydrocarbons (jet fuel) in air is, thus, about 1,000 °C—hardly sufficient to melt steel at 1,500 °C." ^ Eagar & Musso 2001, p. 9: "The temperature of the fire at the WTC was not unusual, and it was most definitely not capable of melting steel." ^ Eagar & Musso 2001, p. 11: "It survived the loss of several exterior columns due to aircraft impact, but the ensuing fire led to other steel failures. Many structural engineers believe that the weak points—the limiting factors on design allowables—were the angle clips that held the floor joists between the columns on the perimeter wall and the core structure." ^ FEMA(403) Executive Summary, p. 2. ^ Newman, Michael E. (2002). "Commerce's NIST Details Federal Investigation of World Trade Center Collapse". National Institute of Standards and Technology. Retrieved July 28, 2006. ^ "Reports of the Federal Building and Fire Investigation of the World Trade Center Disaster". NIST. March 23, 2011. Archived from the original on May 29, 2009. Retrieved May 17, 2011. ^ NIST final report (2005). NCSTAR 1, p. xxxvii. ^ Committee on Science (October 26, 2005). "The investigation of the World Trade Center collapse: findings, recommendations, and next steps". commdocs.house.gov. p. 259. Retrieved April 1, 2007. ^ Quintiere, James (December 2004). "2004 Report to Congress of the National Construction Safety Team Advisory Committee" (PDF). NIST. p. 8. ^ Parker, Dave (October 6, 2005). "WTC investigators resist call for collapse visualisation". New Civil Engineer. England & Wales: EMAP Publishing. ^ "Questions and Answers about the NIST WTC 7 Investigation". NIST. 2012. Retrieved January 30, 2016. ^ "NIST's World Trade Center Investigation". NIST. May 27, 2010. Retrieved August 26, 2010. ^ "Final Report on the Collapse of the World Trade Center Towers" (PDF). National Institute of Standards and Technology (NIST). September 2005. Retrieved August 26, 2010. ^ Newman, Michael (June 29, 2007). "NIST Status Update on World Trade Center 7 Investigation" (Press release). National Institute of Standards and Technology. Retrieved August 26, 2010. ^ McAllister, Therese (December 12, 2006). "WTC 7 Technical Approach and Status Summary" (PDF). NIST. Retrieved February 17, 2008. ^ "NIST NCSTAR 1A: Final Report on the Collapse of World Trade Center Building 7" (PDF). National Institute of Standards and Technology. November 2008. pp. 44–46. ^ Usmani, A.S.; Y. C. Chung; J. L. Torero (2003). "How did the WTC towers collapse: a new theory" (PDF). Fire Safety Journal. 38 (6): 501–533. CiteSeerX 10.1.1.490.2176. doi:10.1016/S0379-7112(03)00069-9. Retrieved May 7, 2007. ^ BRE Centre for Fire Safety Engineering, University of Edinburgh (2006). "Dalmarnock Full-Scale Experiments 25 & 26 July 2006". BRE Centre for Fire Safety Engineering, University of Edinburgh. Archived from the original on July 31, 2012. Retrieved April 23, 2008. ^ Christian, Nicholas (2006). "Glasgow tower block to shed light on 9/11 fire". The Scotsman. Retrieved July 28, 2006. ^ "Skyscraper Fire Fighters". BBC Horizon. 2007. Retrieved July 31, 2007. ^ Kugler, Sara (October 23, 2006). "Officials Wanted More Searching at WTC". The Washington Post. Retrieved October 29, 2007. ^ Rubin, Debra K.; Janice L. Tuchman (November 8, 2001). "WTC Cleanup Agency Begins Ramping Up Operations". Engineering News Record. McGraw-Hill. Archived from the original on October 12, 2007. Retrieved October 20, 2009. ^ "WTC Fire Extinguished". People's Daily Online. December 20, 2001. Retrieved February 19, 2013. ^ "CBS News – WTC Fires All But Defeated – December 19, 2001 23:22:25". CBS News. December 19, 2001. ^ "EPA Response to September 11". Retrieved August 27, 2007. ^ "First Long-term Study of WTC Workers Shows Widespread Health Problems 10 Years After Sept. 11". ScienceDaily. Dwyer, Jim; Kevin Flynn (2004). 102 Minutes: The Untold Story of the Fight to Survive Inside the Twin Towers. Times Books. ISBN 978-0-8050-7682-0. OCLC 156884550. National Institute of Standards and Technology, Technology Administration (2006). "NIST and the World Trade Center". NIST building and fire safety investigation. U.S. Department of Commerce. Retrieved May 2, 2006. Wilkinson, Tim (2006). "World Trade Center – Some Engineering Aspects". School of Civil Engineering, The University of Sydney. Retrieved May 2, 2006. McAllister, Therese; W. Gene Corley; et al. (2002). "World Trade Center Building Performance Study: Data Collection, Preliminary Observations, and Recommendations (FEMA 403)" (PDF). Federal Emergency Management Agency. Retrieved May 2, 2006. Bažant, Zdeněk P.; Yong Zhou (2001). "Why Did the World Trade Center Collapse? – Simple Analysis" (PDF). Journal of Engineering Mechanics ASCE, 9/13/01. Retrieved September 11, 2006. Clifton, G. Charles (2001). "Collapse of the World Trade Centre Towers". CAD Digest. TenLinks, Inc. Archived from the original on April 27, 2006. Retrieved May 2, 2006. Edgar, Dr. Thomas; NOVA (2002). "The Collapse: An Engineer's Perspective". Why the Towers Fell. WGBH Educational Foundation. Retrieved May 2, 2006. Usmani, A.S.; Y. C. Chung; J. L. Torero (2003). "How did the WTC towers collapse: a new theory" (PDF). Fire Safety Journal. 38 (6): 501–533. CiteSeerX 10.1.1.490.2176. doi:10.1016/S0379-7112(03)00069-9. Retrieved May 7, 2007. NOVA online (2002). "The structure of metal". Why the Towers Fell. WGBH Educational Foundation. Retrieved May 2, 2006. Kean, Thomas H. (2004). "Eleventh Public Hearing". Hearings. National Commission on Terrorist Attacks Upon the United States. Retrieved May 2, 2006. Seth Kramer, Daniel Miller (2002). America Rebuilds: A Year at Ground Zero (Television series). United States: PBS home video. "Answers to Frequently Asked Questions (August 30, 2006)". NIST Federal Building and Fire Safety Investigation of the World Trade Center Disaster. National Institute of Standards and Technology. 2006. Retrieved April 21, 2008. Eagar, T. W.; Musso, C. (2001). "Why did the world trade center collapse? Science, engineering, and speculation" (PDF). JOM. 53 (12): 8. Bibcode:2001JOM....53l...8E. doi:10.1007/s11837-001-0003-1. Archived from the original (PDF) on May 10, 2012. Hammett, Kingsley (November 2001). "WHY THE WORLD TRADE CENTER COLLAPSED: An Architect's Perspective". Designer/Builder. Retrieved October 24, 2015. NIST and the World Trade Center The National Institute of Standards and Technology's page on the collapse of the WTC. Contains most recent developments in investigations and FAQs. World Trade Center – Some Engineering Aspects Early suggestion by University of Sydney engineering instructor about how the towers might have collapsed. Bill Biggart's Final Exposures contains a photo of the WTC Marriott severely damaged by the collapse of 2 WTC immediately before the collapse of 1 WTC in which the photographer was killed.